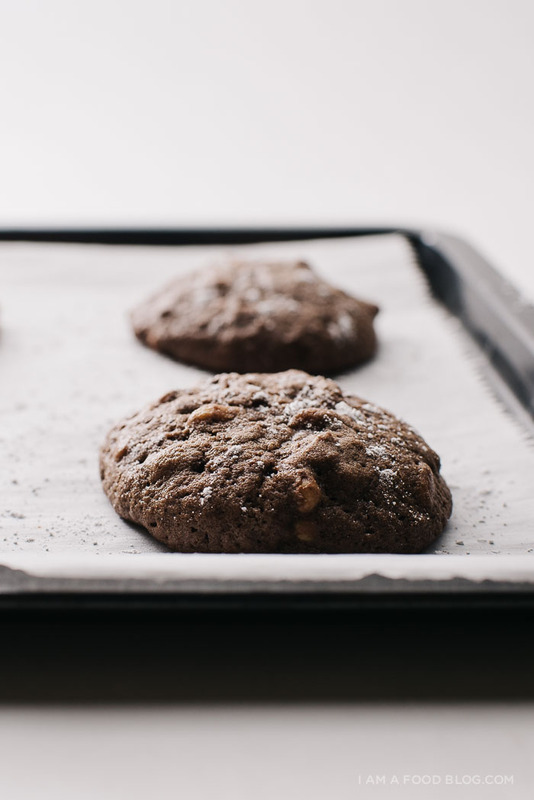 There’s something about baking cookies that makes a house super warm and inviting. Mike and I are back home after being away for a little while and I’ve fallen in love with our house all over again. I love knowing just exactly where everything is and seeing all the little ways we’ve made our house a home. 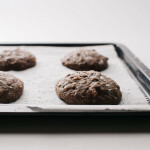 After unpacking (my most hated chore, up there along with packing and folding laundry), I whipped up a quick batch of these cookies from the cookbook of the ever talented Samantha of Love, Cake. 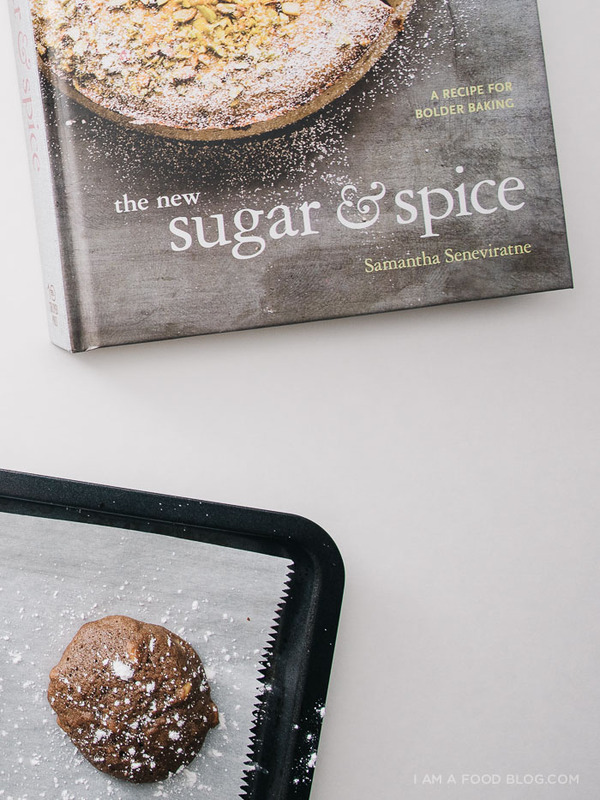 Sam’s new book is full of spice-centric sweets. These all edge brownie cookies are chewy and tender with pools of gooey chocolate. The cinnamon is at the forefront, offering a pleasant bold, but not overpowering punch of flavor. 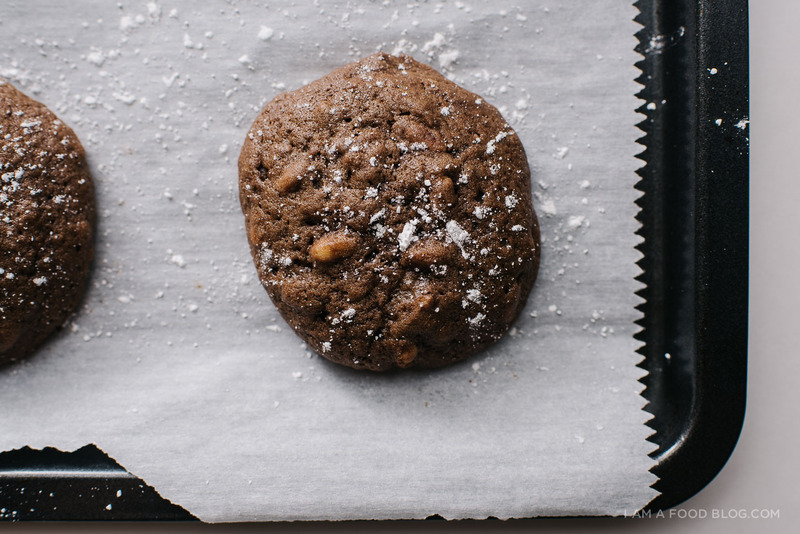 If you’re a brownie edge lover, these cookies are where it’s at. I substituted in some toasty pine nuts for the walnuts, but other than that, kept the recipe as is. If you’re obsessed with spice, and in fall, who isn’t, I hope you pick up this book. The hot honeycomb candy looks fantastic and I can’t wait to cozy up and make the Indonesian Spiced Layer Cake and the Gingerbread. Hope everyone is having a happy November so far! 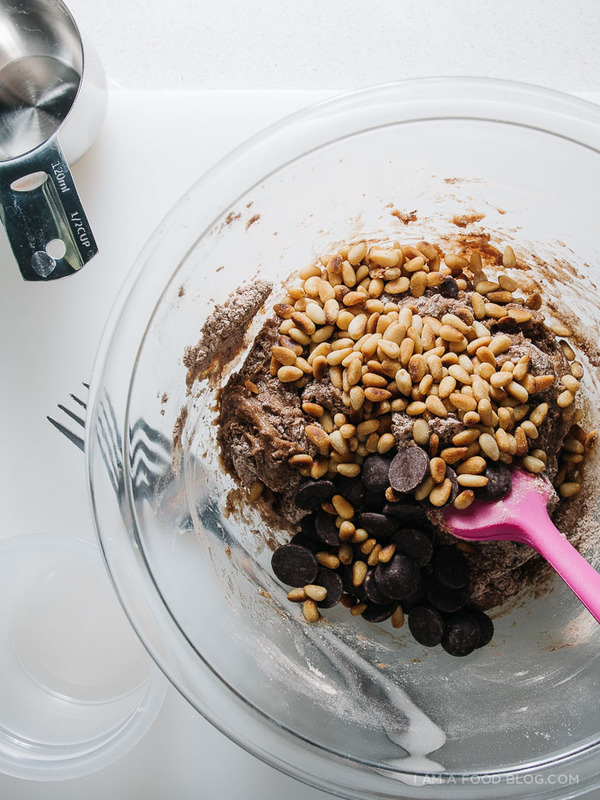 In a small bowl, whisk together the flour, cocoa, cinnamon, salt and baking soda. In a large bowl, cream the butter and sugars, about 2 minutes. Add the vanilla and eggs, one at a time, mixing well. Stir in the flour mix and fold in the chopped chocolate and nuts. Preheat the oven to 325°F. Scoop the dough (it is quite soft) by the 1 1/2 tablespoons on to the prepared pans, at least 1 1/2 inches apart and chill until very cold, at least 30 minutes. When the oven is hot, bake until just set, 12-14 minutes, rotating halfway through. 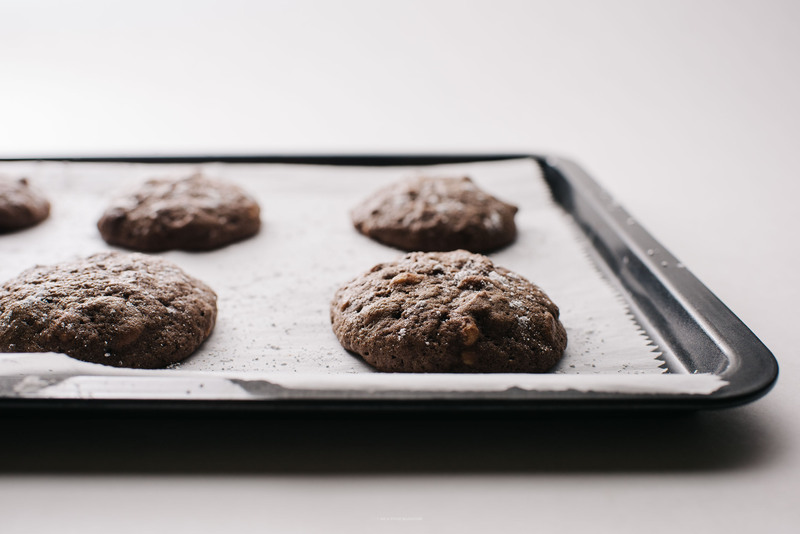 When done, pull the sheets from the oven and tap gently to knock the air out of the cookies. Let cool on the sheets, set on racks. Best warm! Adding toasted pine nuts is such a neat addition! These cookies look lovely! YES. i love the corners (they have the perfect super chewy to softer ratio!). and my parents alwayyyssss ask where the nuts are, so they’ll be satisfied with a bunch of walnuts. Thank you, Stephanie! You are a sweetheart. And pine nuts are such a smart addition. Love it. The recipe title sells it! I always go for the edge brownie. I am looking forward to reading her cookbook. Thanks for sharing these. Ooh ooh ooh these look phenomenal—I’m getting so excited to explore The New Sugar & Spice! And can we talk about your genius addition of pine nuts? WOWZA. I’ve never had chocolate with pine nuts before but my tastebuds are already doing a happy dance in anticipation. My husband will LOVE these. He eats all the corner brownies. Just ate one right now, actually! :) Thanks for the recipe! Ahhh, these look divine!! I need Samantha’s book SO BAD!! Ooooh! I love the addition of pine nuts!! These are def on my need to make list!! This looks like a simple and easy recipe. This could be a fun treat for the holidays! I will definitely try this recipe out. 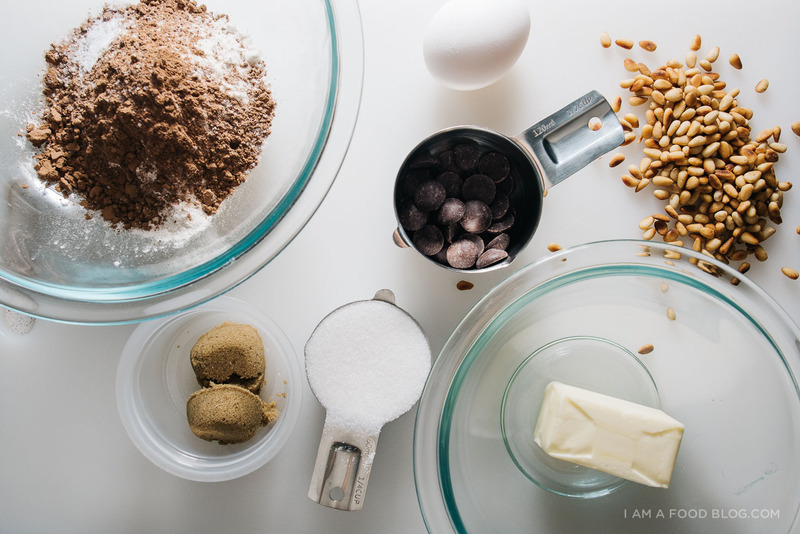 When baking this, I will be excited to test out new ingredients and explore a different variety of foods. I also enjoy how it is a new recipe where I have not seen before. I am thrilled to try it out!